Heterogeneous catalysis plays a part in the production of more than 80% of all chemical products. It is therefore essential that all chemists and chemical engineers have an understanding of the fundamental principles as well as the applications of heterogeneous catalysts. This book introduces the subject, starting at a basic level, and includes sections on adsorption and surface science, catalytic kinetics, experimental methods for preparing and studying heterogeneous catalysts, as well as some aspects of the design of industrial catalytic reactors. It ends with a chapter that covers a range of examples of important catalytic processes. The book leads the student to carrying out a series of "tasks" based on searches of the internet and also on the use of web-based search tools such as Scopus or Web of Science. These tasks are generally based on the text; they can be used entirely for self-study but they can also be tailored to the requirements of a particular course by the instructor/lecturer giving the course. The author has had over 40 years of experience in catalytic research as well as in lecturing on the principles of catalysis. He was for more than 20 years the Editor of Catalysis Today. Chapter 3. How Does a Catalyst Work? Julian Ross has been actively involved in research on surface chemistry and catalysis for more than 50 years. Although he has always worked in an academic environment (UK, The Netherlands, and Ireland), he has throughout his career been closely associated with industrial catalysis companies and has acted as a consultant to many of those active in the field. He is author of more than 200 publications as well as of a significant number of patents on catalysts and processes; his work has been highly cited, his h-index in 2018 being 48 (Scopus). He has supervised more than 50 PhD theses and some 20 post-doctoral researchers working on topics such as natural gas conversion, selective oxidation, membrane catalysis, zirconia as a catalyst support, environmental catalysis, and biomass conversion. He was editor of Catalysis Today (Elsevier) for more than 25 years; in that capacity, he was responsible for commissioning and supervising the production of specialised issues reporting research on most modern areas of catalysis. 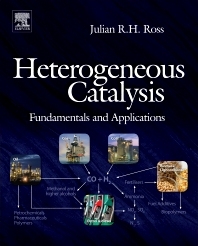 His book, “Heterogeneous Catalysis – Fundamentals and Applications” was published by Elsevier in 2012; the current volume is a modified and much expanded version. A blog giving details of the content and related material is to be found at: www.contemporarycatalysis.wordpress.org.